We are excited to announce our next feature baby -- Nora! We first met Nora and her mother Johanna at Baby + Co's new mom's group. She and Nora's father Vince signed her up for her first Mini Movers series when she was not yet 3 months old. Nora became a pro at tummy time and was learning how to sit and take weight for standing during that three-month series. She started her next series the following month, and soon had mastered sitting and became mobile on her tummy, switching over to Master Movers by the final class in that series! 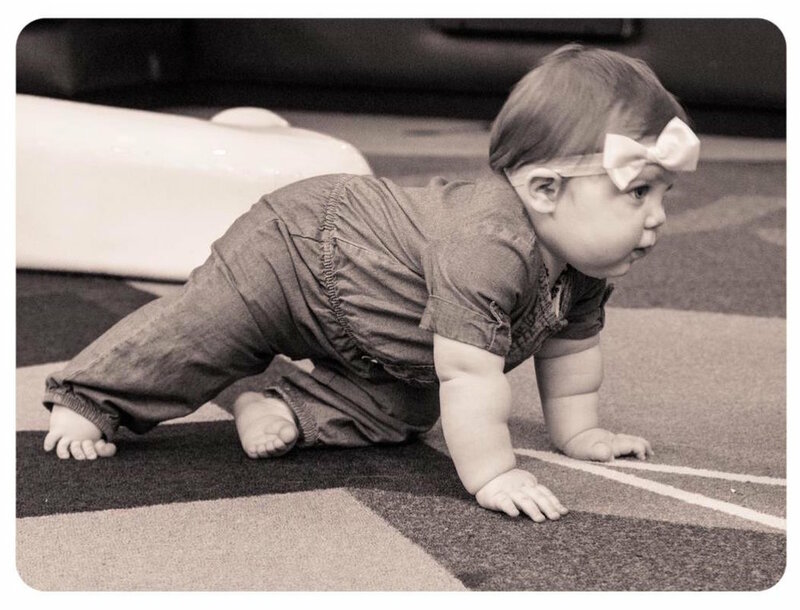 She has a few more Master Movers classes under her belt now, and last time we saw her, she was crawling, pulling up to stand, and starting to stand without support! It's only a matter of time before this little one is taking off walking independently!! Charlie moved up to the Master Movers class in May, and came with a whole new set of tricks! He was crawling on his belly, pulling up to stand, and playing in standing. Over the new few Master Movers classes, Charlie perfected his squatting, standing with his feet flat, cruising between surfaces, and standing without support. He came to class in August ready to show off his newest feat - walking independently! Charlie was so proud of himself and we were all so proud of him too!! He was also happy to show off his amazing throwing skills, which will hopefully serve him well in his future baseball career ;) It was such a pleasure having Charlie and his parents in our classes and having the opportunity to help them ensure that he had a strong foundation of motor development in the first year! It is our pleasure to feature another one of our adorable friends, Rose! We first met Rose and her parents Katie and Bradley in Master Movers class when she was six months old. She was sitting and learning how to pivot on her tummy at the time. The next month, they signed up for the Master Movers three-month series. Over the series, Rose learned how to get up on her hands and knees, crawl, and pull up to stand! Her nanny, Elizabeth, also joined in the classes some times to learn the same things her parents were learning about how to play with Rose to encourage her motor development. They signed up for the next three-month series, and during that series, she went from taking a couple steps to taking off walking everywhere! It has been such a delight to have Rose and her family in classes! She is truly a special little girl with such a sweet and joyful spirit. In her last class with us, she brought toys to the other babies and gave them hugs & kisses - such a sweetie! We will miss having you in classes and wish your parents the best of luck in chasing you around now that you are really On The MOVE! It is time to feature another one of our little friends, and this month it is Willa! "As a first time mother, what brought me to Babies On The MOVE was a desire to learn how to play with my child in a way that encouraged development of her gross motor skills, but was also a fun way to set a precedent for learning together. Willa started rolling over at 5 months and sitting up at 8 months, but by 9 months she still wasn't crawling while many of her peers were standing, or even walking. She was extremely observant, but didn't really seem very motivated to actively participate in play. At 9 months we attended our first BOTM session and Willa had a blast. She enjoyed interacting with her classmates which was wonderful to see, and I felt more at ease about Willa's development after talking to Becca, Rachel, and the other parents. By the end of the first series Willa was starting to crawl and was feeling much more confident in her movement, so we signed up for another series. They did an assessment and felt that Willa's hips seemed to need strengthening, so they recommended a pair of special shorts that would help. They absolutely did, and after wearing them for a few weeks Willa stood for the first time on her own. Willa still has a way to go before walking on her own, but she loves coming to class, continues to progress, and seems a little more brave after each session. We plan on signing up for another series as Willa continues to strengthen her skills. We are grateful to Becca and Rachel for their insight and warmth and for offering an environment for parents like myself to learn from experts in their field. It has a been a wonderful experience for our family".